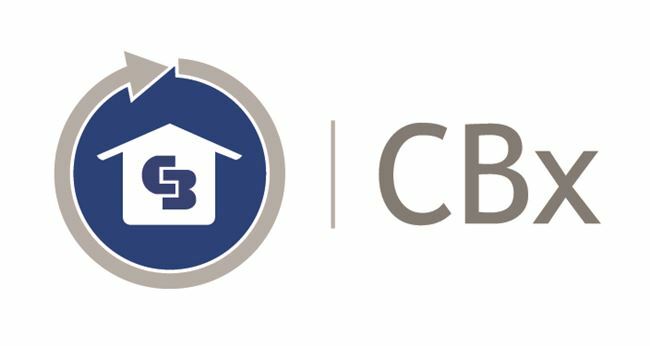 CBx is a first-of-its-kind app in the Real Estate industry, created exclusively for Coldwell Banker Real Estate LLC and their agents for iPad, Android and Microsoft Surface tablets. 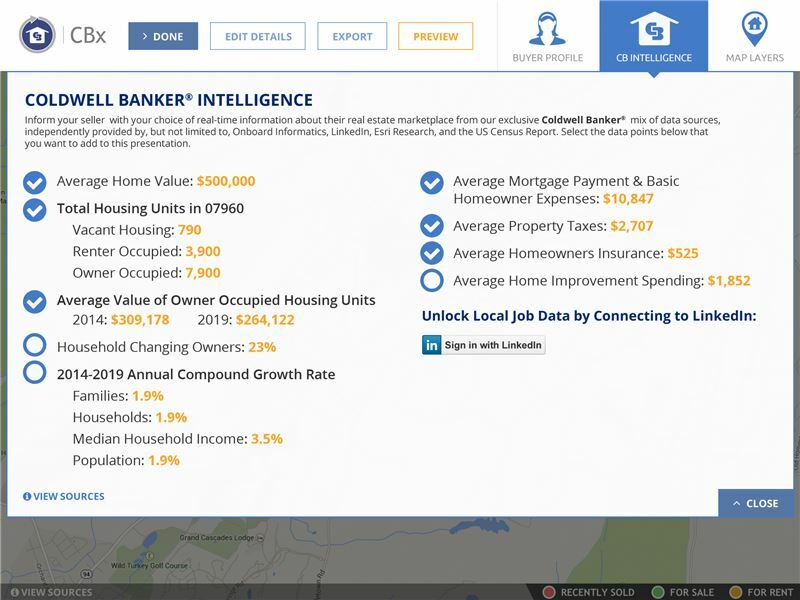 CBx has transformed the way Coldwell Banker agents list homes and engage with home sellers, marrying the power of big data with their local expertise to help create a custom listing price, relevant to the most likely buyer profile for their local community. To win a listing, a listing agent must show their value and knowledge not only of their neighborhood, but how they are going to market the home to the right buyers and sell it for the highest return, in the shortest timeframe. 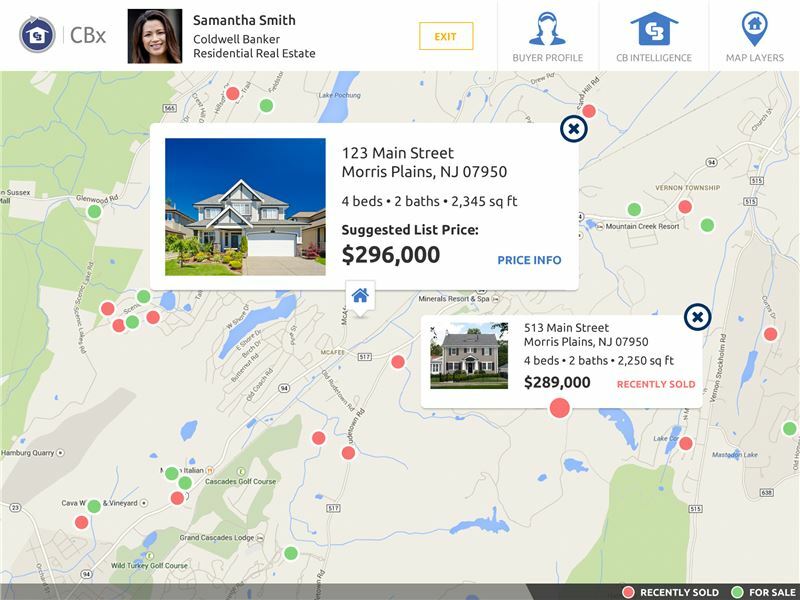 And CBx helps them do just that -- creating a listing experience that combines data intelligence from over 8 separate sources using a proprietary algorithm to help define the most likely buyer profile, where they may be moving from, what media channels to use in a marketing campaign and the estimated listing price of the home. The tool goes above and beyond a standard listing presentation, transforming it from a presentation an agent gives to a listing experience and conversation between the agent and seller with valuable visualizations of buyer and market information that no other national Real Estate brand has access to, giving Coldwell Banker agents a unique advantage. 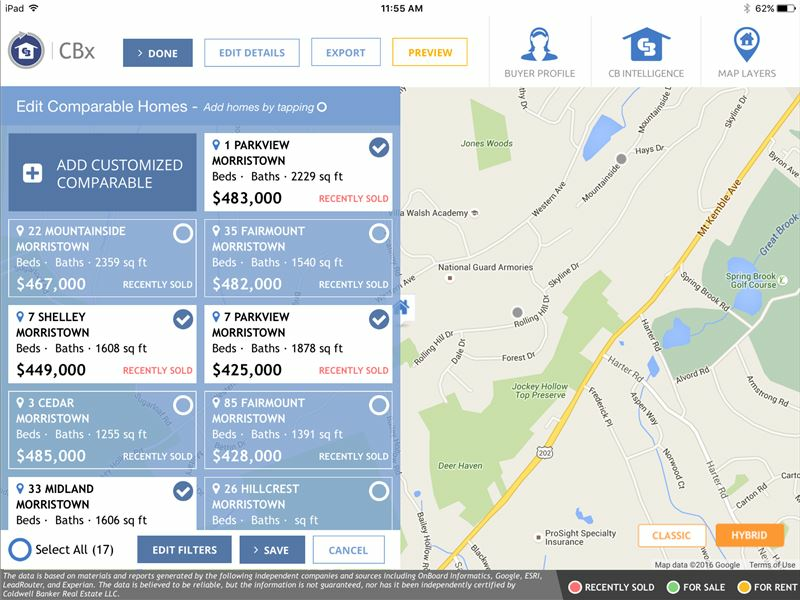 The app consists of an admin dashboard , where an agent can make all their data selections to build a story specific to the seller and then use the presentation mode to display only what the agent found relevant to the seller, in a nicely visualized map dashboard. An agent starts with the address and details of their listing to pull in an estimated listing price that can be enhanced to meet the unique qualities of the house. 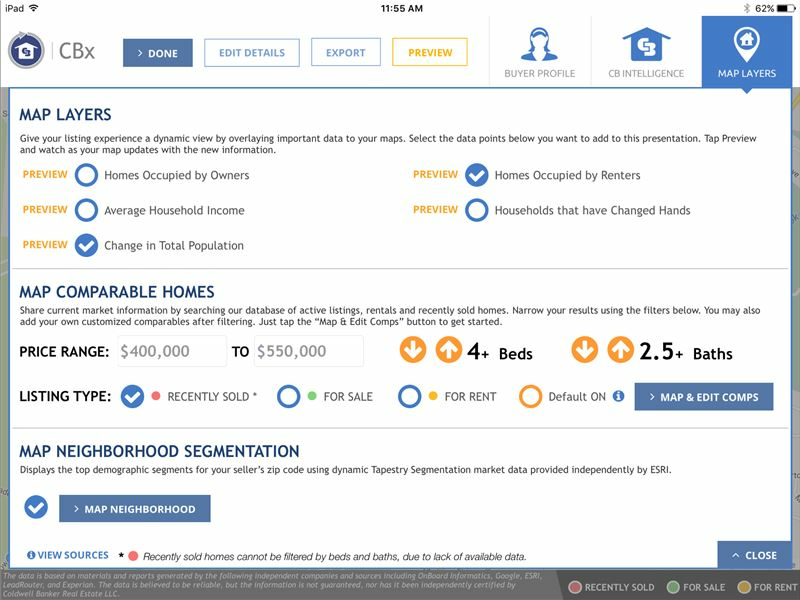 Then, the agent can choose from market data like average property taxes, average home value, annual compound growth rate of the population and households. 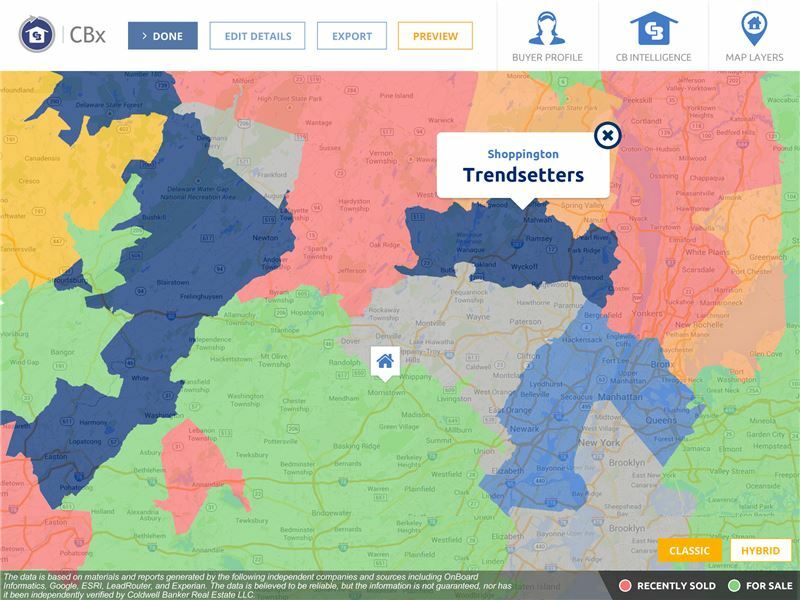 Next, agents can use the predictive analytics available to them that help identify the potential buyer profile, including what markets or towns they are most likely to come from.  Finally, they can also pull in the comparables that best fit their presentation. CBx has over 10,000 downloads so far, even though the rollout to all affiliates is still in process including a Canadian version under way. It is estimated that this is approximately 40% of the active Coldwell Banker agents while in the past adoption rates for agent tools generally fell at about 5-10%. In addition to this success, there have been many testimonials of agents getting listings faster, getting deals with more expensive listings, selling listings faster and selling at a higher price because of CBx and the data they were able to share. Some agents use the benefit of the likely buyer profile to drive targeted advertising via Facebook ads, several of whom received a buyer who looked just like the profile they predicted!